Trooper Johnson was born in North Stratford, New Hampshire in 1888. He spent many years in Groveton, where his parents owned the Eagle Hotel, and in 1940, he moved to Lancaster. He was first employed by the State Motor Vehicle Department in 1924. 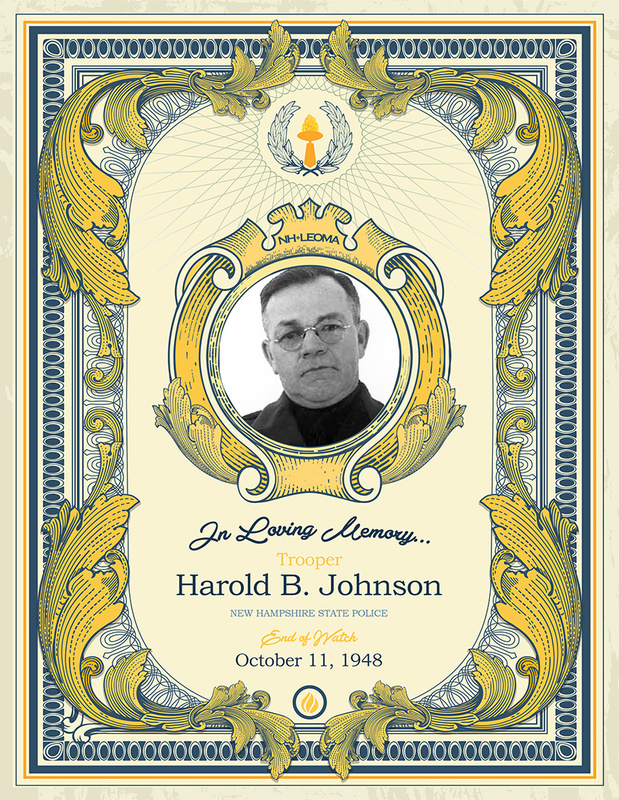 In 1937, Trooper Johnson became one of the first State Troopers in New Hampshire, wore the No. 1 badge, and was, at the time of his death, the longest serving Trooper on the force. Trooper Johnson had just returned to duty after nine months of medical leave, after having his leg crushed by a vehicle while directing traffic on New Year’s Eve. On October 11, 1948, after returning from a court hearing in Groveton, the cruiser that Trooper Johnson was riding in collided with the side of a Boston and Maine freight train at a crossing. Trooper Johnson died instantly along with Lancaster Police Chief, Andrew T. Malloy. The driver of the cruiser, Trooper Fred Helms, suffered a concussion and other injuries, but survived the crash. Trooper Johnson left behind his wife, Mae, and three children; Stanley, Jean and Joy.